“The question isn’t ‘what can you do there?’ It’s more like ‘what can’t you do there?’” says Kim, a cashier at Walford Boutique on Prince Street. Every time we’ve come to SoHo, it has been a new adventure. Last July, on an electric summer night on Broome Street, after celebrating our friend Ciara’s very sweet 16th birthday, we were making a commemorative dance video when Ryan Seacrest joined us out of nowhere. We met Ryan Seacrest! 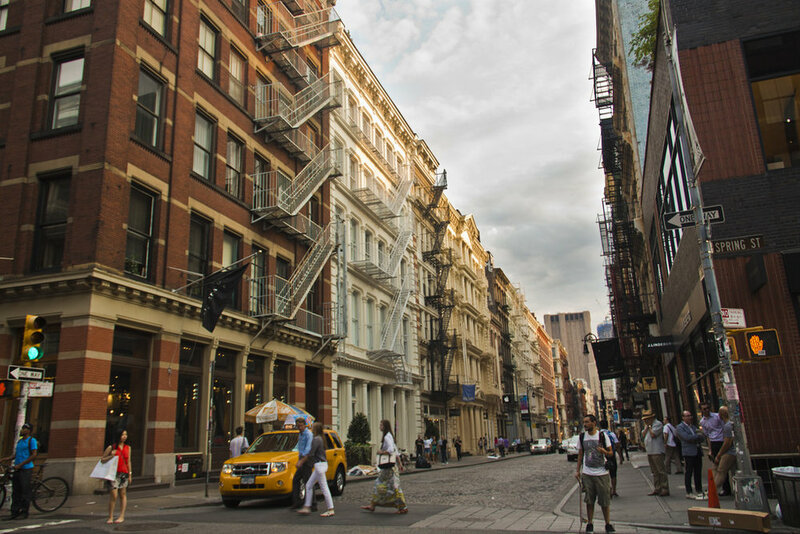 Although SoHo -- the neighborhood that stretches south of Houston Street in Manhattan until you reach Canal Street -- is small enough to stroll through in an hour, it can satisfy a New Yorker’s dining, shopping, and living needs. SoHo is suitable for a number of occasions, whether it’s shopping for trendy Christmas gifts on Broadway, enjoying a date seated outside of the Laudree New York cafe with scrumptious french macaroons on a sunny spring day, or celebrating a special birthday at the hip underground restaurant Black Tap (529 Broome St). With rusty light bulbs hanging over the wooden tables and the black and white tile floors clashing with the wooden walls, Black Tap is definitely a restaurant that stands out compared to other small cafes in SoHo. The tiny staircase outside leads down to a dimly lit dining area, giving the place a cozy, hidden feeling. The restrooms in the restaurant are filled with graffiti and sharpie scribblings on the wall made by customers and employees. It’s interesting to see all the funny, quirky things people write. Black Tap serves a wide variety of burgers and wraps with a choice side of salads or fries: salty, sweet, cubed or curly. Also on the menu are a number of yummy vegetarian options. Average meal prices range from $12 to $18. Despite the savory meat and tasty fries, Black Tap is most known for its extravagant milkshakes. Their tall, mouthwatering shakes come topped with whipped cream, candy, brownies, cookies, ice cream, and just about anything you can think of that might trigger a sugar rush. These oversized shakes make up for the long wait on line. This place is a hangout hotspot, especially on a Saturday afternoon. “This is my family’s seventh time here,” said Elena, Brooklyn mother of two, who has come to Black Tap every year for the past five years to celebrate her birthday. “I can never get enough of the Brooklyn Blackout shake,” she said, with wide eyes and a smile. We wanted to experience a birthday at Black Tap ourselves to see just what Elena keeps coming back for, so we told a little white lie and pretended it was one of our birthdays. To our surprise, the entire restaurant stopped what they were doing to sing “Happy Birthday,” each waiter seemingly more enthusiastic than the next. They brought us a jaw-dropping birthday shake with a giant slice of birthday cake on top and a sparkling candle. (We almost started to believe it actually was our birthday with all the special treatment we were getting.) It was an experience we would never forget. Ironically, we started with dessert and didn’t have room for a meal. The milkshakes were big enough to keep us full for the next couple of hours. “My girls always share one and they still don’t finish,” Elena said. In SoHo, every turn of the street represents a different culture. SoHo is home to well worth-it seafood spots, from trendy and affordable Ed’s Lobster Bar to the upscale Aquagrill and Lure Fishbar. When you’re feeling a sweet tooth, you can easily take a turn to Georgetown Cupcakes or Little Cupcake Bakeshop on Prince Street, both serving a wide range of cakes and desserts in an earth-conscious environment. Tree huggers, this is the place for you to indulge your sweet tooth! A few blocks down, you’ll find Shuka, which serves contemporary Eastern Mediterranean food. On the corner of Prince Street and Broadway, we bumped into Giovanni, an Italian immigrant visiting New York to spend the holidays with his family. Giovanni didn’t speak much English. He was asking us for directions to Dyker Heights, where his cousin lived. He had accidentally taken the wrong train into the city and thought he was still in Brooklyn. Giovanni wasn’t too down about his travel mishap but was instead excited to be in such a “beautiful city,” as he said. “Now I can buy American fashion,” he said laughing before we parted ways. But there’s more to SoHo than full stomachs, shopping bags, and Instagram-worthy photos. There’s also culture. The Leslie-Lohman Museum of Gay and Lesbian Art (26 Wooster St) was one of the most interesting activities we had planned out that day. Admission is free, though you are also given the option to donate $9 to the Leslie-Lohman Gay Art Foundation. In 1969, Charles Leslie and Fritz Lohman organized the first exhibit of gay artists in their shared SoHo loft. Their collection grew as they salvaged the work of dying artists who were affected during the AIDS pandemic in the 1980s. This eventually led to the organization that the museum still stands for today. One painting that caught our eye was a self portrait of Donna Gottschalk. It is a black and white painting of Gottschalk lying in a bed in what seems like a wooden cabin, wearing a simple white t-shirt and cargo pants. It was almost like she was staring directly into your eyes through the painting with the most relaxed, nonchalant facial expression. We learned that Gottschalk was known for coming out as an activist for gay and lesbian rights, and she took an interest in gay and lesbian art because she was “intrigued by the way such beautiful art can stand out in a time where lesbians were seen as criminals and sexual predators,” said Lena, an employee who was happy to talk to visitors walking around the museum. Aside from the beautiful scenery, shopping, and amazing milkshakes, we learned so much about not only the diversity and acceptance among the people in SoHo, but how much history is present in what seems like a neighborhood based around shopping and eating. This was not our first time being in SoHo, but with all the new memories we made worth sharing, it definitely won’t be the last.